Lakes are inland bodies of standing water. Although millions of lakes are scattered over Earth's surface, most are located in higher latitudes and mountainous areas. 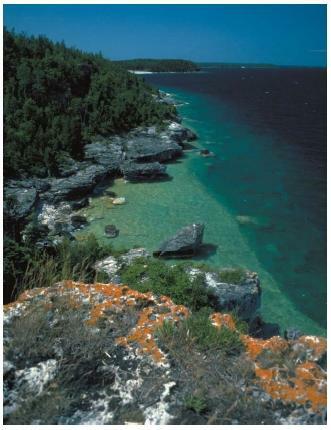 Canada alone contains almost 50 percent of the world's lakes. Lakes can be formed by glaciers, tectonic plate movements, river and wind currents, and volcanic or meteorite activity. Some lakes are only seasonal, drying up during parts of the year. The study of lakes, ponds, and other freshwater bodies is called limnology (pronounced lim-NOL-o-gee). Although ponds are considered small, shallow lakes, there is one important difference between the two bodies of water: temperature. Ponds generally have a consistent temperature throughout, whereas lakes have various temperature layers, depending on the season. The Great Lakes of the United States and Canada are the world's largest system of freshwater lakes. Lake Superior, the northernmost of the Great Lakes, is the world's largest freshwater lake with an area of 31,820 square miles (82,730 square kilometers). Lake Titicaca in the Andes Mountains on the border between Peru and Bolivia is the world's highest large freshwater lake at 12,500 feet (3,800 meters) above sea level. Some freshwater lakes become salty over time, especially in arid regions. Because the water in these lakes evaporates quickly, the salt from inflowing waters reaches a high concentration. Among the world's greatest salt lakes are the Caspian Sea, Dead Sea, and Great Salt Lake. Covering an area of about 144,000 square miles (372,960 square kilometers), the Caspian Sea is the largest lake in the world. At 1,292 feet (394 meters) below sea level, the Dead Sea is the lowest lake in the world. Most lakes on Earth were formed as a result of glacier activity. Earth's glacial ice formed and extended into what is now Canada, the northernmost United States, and northern Europe. As the heavy, thick ice pushed along, it created crevices by scouring out topsoil and even carving into bedrock (the solid rock that lies beneath the soil). Glacial growth peaked about 20,000 years ago, after which time the ice slowly began to melt. As the ice melted, the glaciers retreated, but the basins formed by glaciers remained and filled with water from the melting glaciers. Movements of Earth's crust, water, and wind can also form lakes. The moving of the plates that compose Earth's crust (called tectonic activity) often forms basins, especially along fault lines (where plates meet and move against each other). These basins or depressions fill with water, forming lakes such as Lake Baikal in Siberia. Blowout: Lake basin created in coastal or arid region by strong winds shifting sand. Caldera: Volcanic crater that has collapsed to form a depression greater than 1 mile (1.6 kilometers) in diameter. Eutrophication: Natural process by which a lake or other body of water becomes enriched in dissolved nutrients, spurring aquatic plant growth. Limnology: Study of lakes, ponds, and other freshwater bodies. Oxbow lake: Lake created when a loop of a river is separated from the main flow by gravel, sand, and silt deposits. 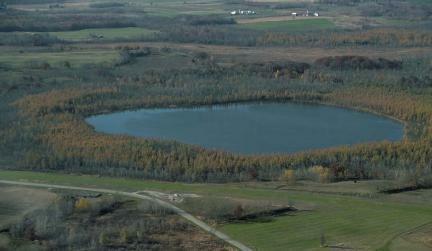 Solution lake: Lake created when groundwater erodes bedrock, resulting in a sinkhole. Turnover: Mixing and flip-flopping of the differing temperature layers within a lake. Water currents and land erosion by water form oxbow and solution lakes. Oxbow lakes are created when winding rivers such as the Mississippi change course, carrying water through twists and turns that form loops. As deposits build up and separate a loop from the main flow of the river, an oxbow lake such as Lake Whittington in Mississippi forms. Solution lakes result from groundwater eroding the bedrock above it, creating a sinkhole. Lakes from sinkholes are the predominant type in Florida and on Mexico's Yucatan Peninsula. Wind can also create lake basins called blowouts, which usually occur in coastal or arid regions. Blowouts created by shifted sand are typical in northern Texas, New Mexico, southern Africa, and parts of Australia. A few lakes are formed by volcanic activity or meteors. After erupting, some volcanoes collapse, forming basins that collect water. Volcanic basins with diameters greater than one mile are called calderas. Crater Lake in Oregon (the seventh deepest lake in the world) is a caldera 1,932 feet (590 meters) deep, 6 miles (10 kilometers) long, and 5 miles (8 kilometers) wide. The largest meteorite-formed lake in the world is found in New Quebec Crater (formerly Chubb Crater) in northern Quebec, Canada. It is 823 feet (250 meters) deep inside a crater about 2 miles (3 kilometers) wide. turnover. Turnover occurs when water in an upper layer is denser, or heavier, than the layer of water underneath it. Cooler water tends to be denser than warmer water. Deeper water is generally both denser and colder than shallow water. In autumn, the upper layers of a lake cool down because of the cooling air above. Eventually, these layers, mixed by winds, cool to a temperature lower than that of the layer at the bottom of the lake. When this occurs, the lowest layer rises to the surface, mixing with the other layers. This process is called fall turnover. In spring, ice covering a lake melts and mixes with the upper layer, which then becomes denser than the layers beneath. Mixing takes place and the whole lake turns over. This is spring turnover. Pollution is the major threat to the life of a lake. Acid rain is formed by sulfates and nitrates emitted from coal-burning industries and automobile exhaust pipes. These chemicals combine with moisture and sunlight in the atmosphere to form sulfuric and nitric acids that enter lakes via rain and other precipitation. Acid rain is 10 times more acidic than normal rain. When a freshwater lake becomes too acidic, its life-forms gradually die. Other chemical pollutants include fertilizers and pesticides, which enter lakes through soil run-offs into streams. Pesticides are toxic to fish, while fertilizers can cause eutrophication (pronounced YOU-trofi-KAY-shun). Eutrophication is the natural process by which a lake or other body of water becomes enriched in dissolved nutrients (such as nitrogen and phosphorus) that spur aquatic plant growth. Increased plant growth leads to an increase in the organic remains on the bottom of a lake. Over time, perhaps centuries, the remains build up, the lake becomes shallower, and plants take root. Finally, as plant life fills in the water basin, the lake turns into a marsh and then a meadow. Chemical pollutants, including phosphorous and nitrogen compounds, can artificially accelerate this aging process. The growth of algae and other plant life is overstimulated, and they quickly consume most of the dissolved oxygen in the water. Soon, the lake's oxygen supply is fully depleted and all life in it dies. I appreciate your work, the article is precise and easily understandable. Congratulations!! Keep the good work alive. What about tropical lakes (Victoria forexample)? Do they turnover? Just thinking that in tropic there's no annual temperature changes. Does the salt and other minerals that rivers carry to tropical lakes accumulate at the bottom? Or how do they stay freshwater lakes (if they do)? what are the defferences between crater lakes and a caldera and their possible causes.